Persevere: (v) to continue in some effort, course of action, etc. in spite of difficulty, opposition, etc. ; be steadfast in purpose; persist. 2008 presented its own set of challenges for my little family here at the Shabby Nest. We made it through, and now we look forward to 2009 as a year of opportunity and hope. And so it wasn't hard for me to pick our word of the year for this year...persevere. Here's to 2009...may it be a year of opportunity and hope for all of us! Wishing you and your family the best for 2009! Found your blog today...love it. Persevere. Good word. Hopefully, next year you'll have two words to sum up the year PAY OFF!! Blessings & Wishing for Good things for you and your family in the new year. I hope you don't mind, I'm a lurker here, and I LOVED your word of the year so much, I borrowed it. I posted about it at my blog, this word is going to help me get moving again, and do things that I would prefer not to do! What a great idea for a word of the year. I hate that you had rough '08. I hope you have a wonderful '09. My husband is Mr. perseverance....wish it would rub off on me. Our families word is SLOWDOWN. I forgot to take time to enjoy my home and chlidren last year. Can't let that happen again. That is a great word for the year. Hope 2009 is a great one! That is a perfect word! It's so difficult, at times, to keep on going. I'll use this word, as well as one that I'm continuing after my recent divorce...PEACE. Wendy! 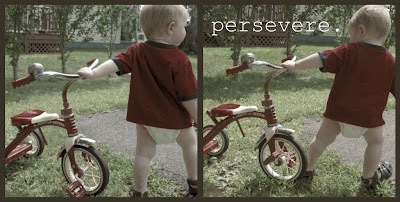 I love 'persevere'. It's an action word and you seem to be a girl that gets things done! My own definition of persevere is "hanging on longer than the advesary". When you feel the darker forces of doubt shroud about you - hang on! They will cease. Best wishes to you in a New Year. Just popped in to say I adore your blog! happy new year! I love the word of the year idea. I think I need to pick one myself. Oh how I feel like the word "Persevere" captures 2008 in my world! Happy New Year and my 2009 hold many blessings from God for your family as you press on! Wendy - stop by my site again. You inspired me to expand on "perseverance". Thanks for your inspiration! Have a great day.